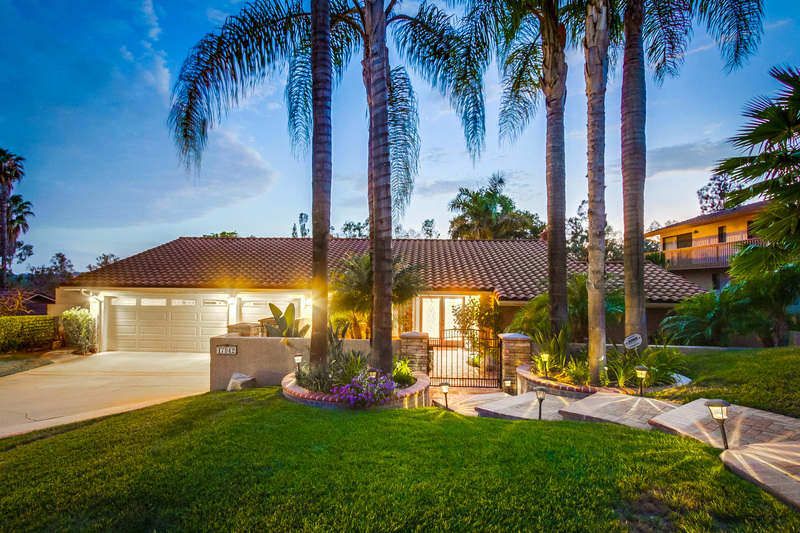 Fabulous, private highly upgraded 4BR/3BA bi-level home with approx. 2,436 sq. ft. in North Poway. Fantastic home for entertaining featuring gated brick front courtyard, Travertine flooring, gourmet kitchen, stainless steel appliances. Luxurious master bedroom suite featuring fireplace, skylights and over-sized walk-in closet. Private backyard with sunset views, built in BBQ and bar height concrete table, pool/spa with rock waterfall and 2 gas fire bowls and swim up bar. Spacious patio, rose garden, fruit trees, .29 acre lot and 3 car garage with full walk up attic with an abundance of storage. Highly acclaimed Poway Unified School District. No Mello Roos or HOA fees.